Extend Your Hands and Eyes with this 7mm smallest camera head lens. This Inspection Camera allows you to inspect hard-to-reach areas. This Snake scope is an ergonomic handheld video endoscope system with robust and semi flexible insertion tube. It can easily be operated by plugging directly into your computer or Laptop. The 6 LED lights source allows adjustable illumination for more easy finding and diagnosis. See in the dark or in low light at short range with 6 infrared LED. It can capture high quality images and videos (AVI) with rich color throughout a large dynamic range. It's 830mm flexible tube with smallest 7mm waterproof camera head and its innovative design, as well as its easy accessibility, is a handy and versatile feature for a tool for home or professional use. It enables you to perform a detailed visual inspection of the tightest, hardest to reach spots like under a car, down a drain or anywhere a 7mm diameter, 1030mm long camera will reach. 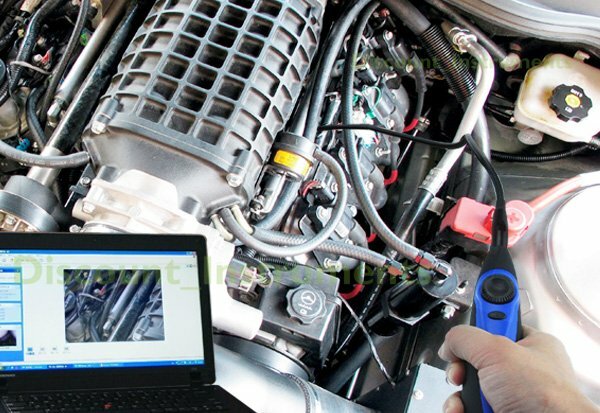 * automotive applications: vehicle maintenance, checking under the hood, etc. Ideal for plumbers to access the damage before dismantling pipes or for home use when someone drops valuables down the drain. Now with a handy and durable plastic (PE covered) handler for added protection.